Aluminium sulfate is used in water purification and as a mordant in dyeing and printing textiles. In water purification, it causes impurities to coagulate which are removed as the particulate settles to the bottom of the container or more easily filtered. This process is called coagulation or flocculation. 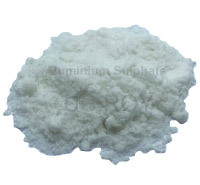 When dissolved in a large amount of neutral or slightly-alkaline water, aluminium sulfate produces a gelatinous precipitate of aluminium hydroxide, Al(OH)3. In dyeing and printing cloth, the gelatinous precipitate helps the dye adhere to the clothing fibers by rendering the pigment insoluble.